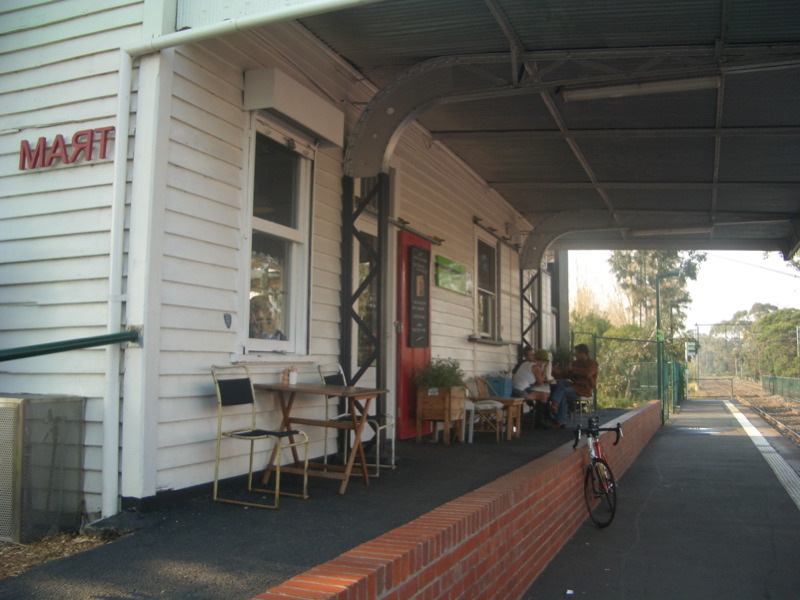 On Saturday morning I was meeting Mum and Dad for breakfast, so I took them out to a place they hadn't been but I was pretty sure they'd like: Mart 130, a cute little cafe built inside the light rail tramstop #130 ('mart' being 'tram' backwards, geddit?) alongside Albert Park Lake. 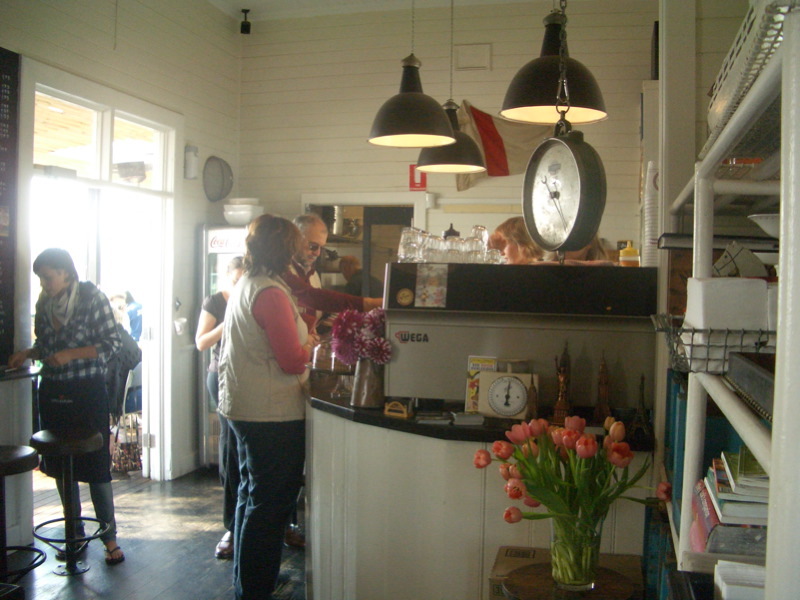 The old Station Master's house is airy and spick 'n span, and has a cosy ambiance. As it was a bright sunny morning, we opted to sit outside on the back verandah overlooking the lakeside tennis courts. The dish I ordered won The Age Cheap Eats 2008 Breakfast of the Year award, and I think they may be on to something. 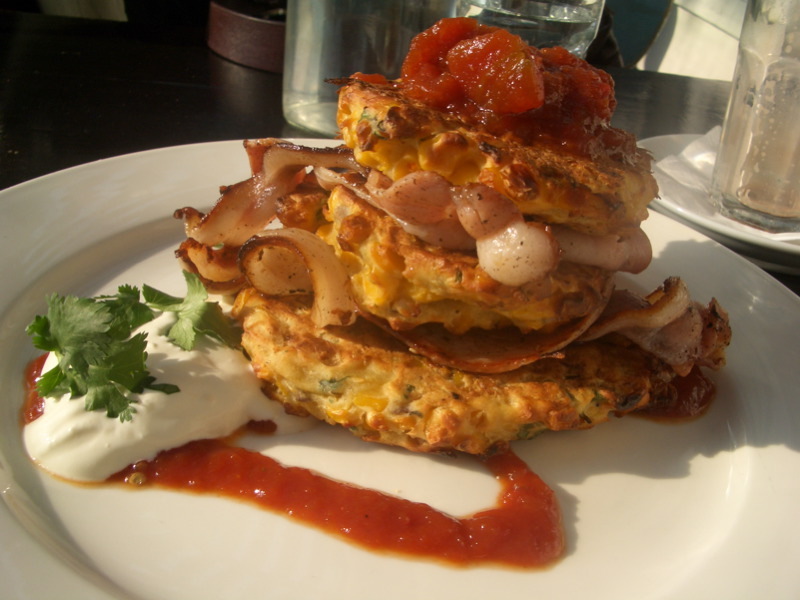 Oven-roasted corn fritters stacked in a tower between slices of grilled bacon, and served with a drizzle of homemade relish, a dollop of sour cream and a sprig of coriander ($15.90). They were easily the best corn fritters I've had in years - the corn was so damn juicy and tasty, and the saltiness of the bacon went really well with the corn and the sour cream. A real highlight! Dad ordered the baked cannellini beans with Gruners' ham hock served on Dench's organic sourdough toast and crumbled with goat's cheese ($14.90 or you can get it vegetarian for $13.90 - but if you ask me the vegetarians are getting short-changed with that price!). 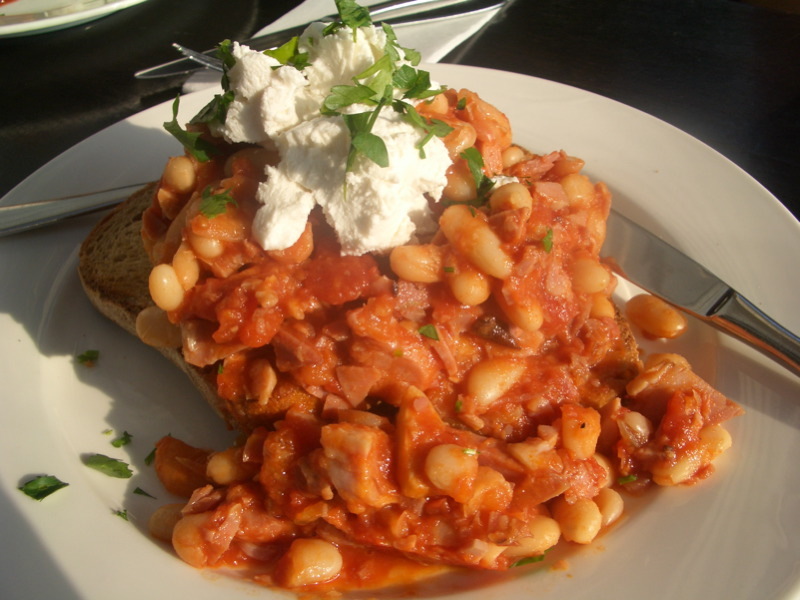 This was also very good - an Italian variation on the usual baked beans on toast. The sharp goat's cheese on top was an inspired addition. 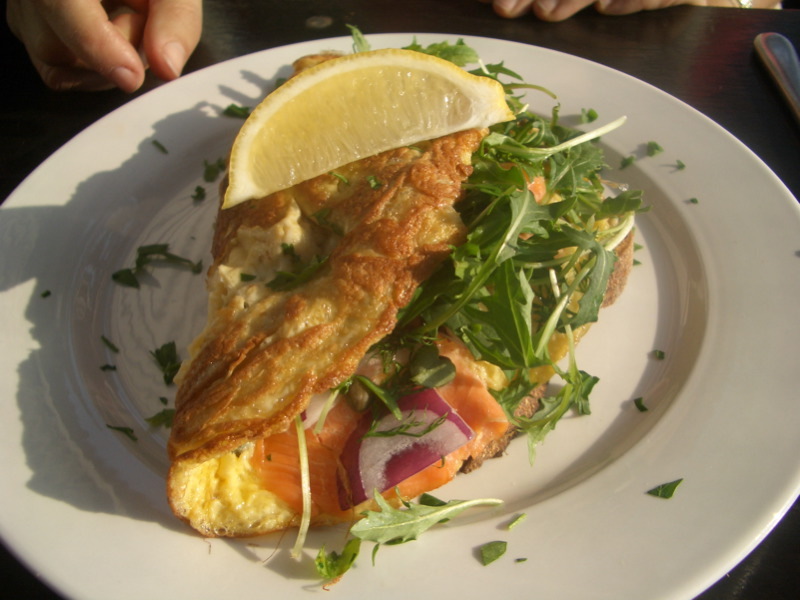 Mum loves salmon, so she couldn't resist the omelette special - free range omelette with smoked salmon, dill, capers, red onion, rocket and lemon on organic bread ($16.90). A very 'Mum' sort of dish. She liked it (didn't LOVE it as much and Dad and I loved our dishes, but as she said: "At the end of the day, an omelette is an omelette...") - though she commented that the salmon was of excellent quality, and not too salty. Oh how funny... I was in a tram passing by at 10am on the same day! 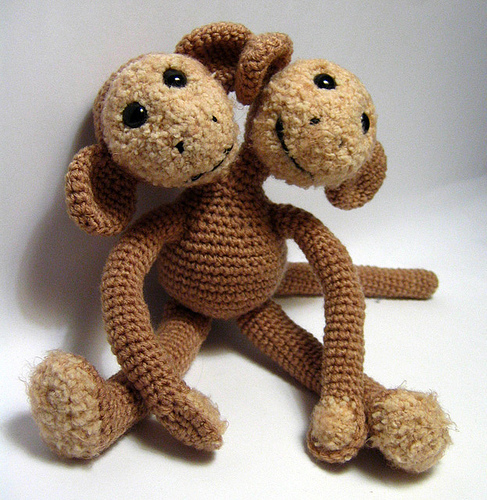 And I looked out the window and thought 'ooooh cute'. Thanks for enlightening me! Duncan, to think we were in the same place at the same time but passed each other like trams in the night, alas! Check it out sometime, I really enjoyed the food there. Haha I had a similar brazilian tv site saying that my blog was likable as well. 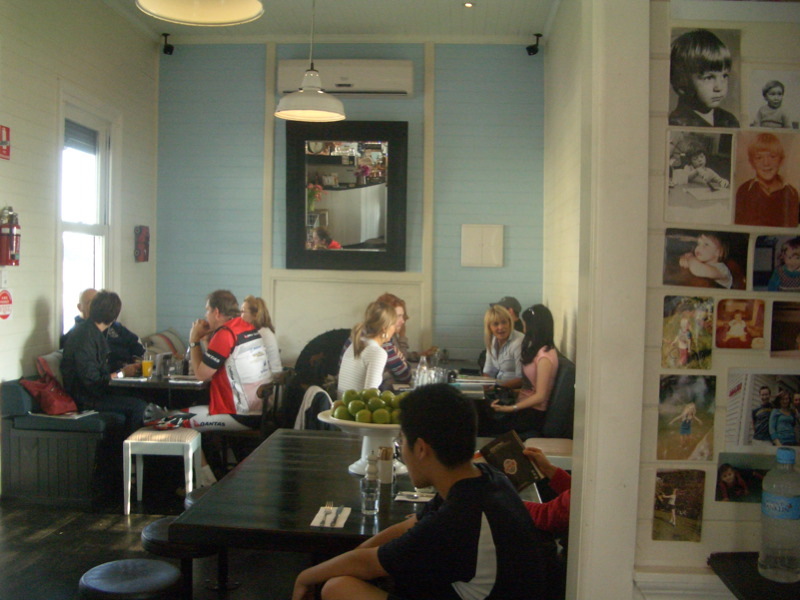 Looks like a good place to have breakfast, one I certainly wouldn't mind going to. If you wouldn't mind me asking, what tram is it that passes through that stop 130?